We've had a big sign this week that ethical fasion has taken another step into the mainstream. We're not just being talked about in the news. We're being talked about by John Oliver. For those of you not in the know, John Oliver is the host of Last Week Tonight, a satirical news show with much of the DNA of The Daily Show--a programme that's regularly cited as the most incisive factual programming out there, despite the laughs... or maybe because of them. Oliver got his start on The Daily Show as the comedy Brit. Given his head on Last Week Tonight, he uses equal parts of outsider bafflement and righteous "you just pushed past me in the queue" anger to create items that cut to the bone of the big stories of the day. Last Night Tonight is credited with turning around the conversation on net neutrality, couching it in terms people actually understood, and forcing an embarrasing climb-down by the FCC on what had been widely percieved to be a done deal. Now Oliver has turned his laser focus on the damaged and damaging world of fast fashion. It's a hell of a ride. I suggest you take a 15 minute break, turn up your speakers, and let this one go. If you needed one argument for why we need ethical fashion, it's right here. 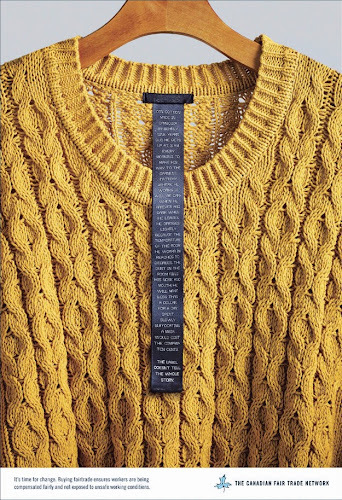 #WhoMadeMyClothes... and does anyone care? Happy Fashion Revolution Day! 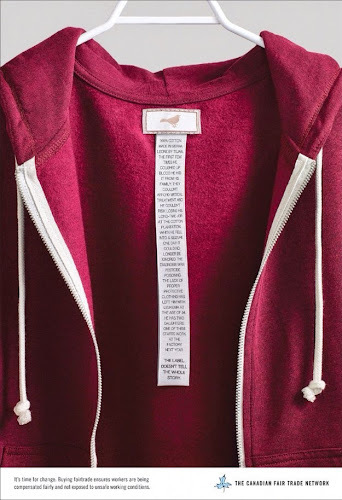 Across the globe, people are turning their clothes inside out, showing off the labels and asking the brands that they wear one simple question... who made my clothes? Last year's event was an incredible success, with citizens of 55 different countries generating over 6 and a half million hits on Google, a top trend through the day on Twitter and massive coverage in the international press. This year, Fashion Revolution are hoping to build on that success and get more people than ever questioning the opaque supply chain and secretive business practices of many big fashion brands. In other words, it's a distraction rather than actual activism, a gesture with little meaning. But surely the principal purpose of campaigns like Fashion Revolution Day is to raise awareness. To which Lewis simply says, "define awareness". Owch. However, this bleak view isn't reflective of general opinion. The trick is to track just what's going on after you click send on that form you came across on Twitter. Carol Cone, global practice chair of business and social purpose for PR giant Edelman, has found that 20% to 30% of respondents to a poll will pass it around social media, while about 10% to 15% will want to get involved at a deeper level. When you have engagement of any kind numbered in the millions, 10% can still make a heck of a difference. And of course, any campaign with a huge number of signatories is a powerful persuasive tool if it's used correctly. The people involved in Fashion Revolution Day have decades of experience in the fields of fashion and public relations, and understand the clout of a fat petition. FRD has leveraged the attention that last year's event engendered into a set of talking points that have been discussed in the UK Government, and in continuing dialogues with The European Union and the Fair Trade Advocacy Office in Brussels. That's hardly dead air over the issues. The trick now is to keep that attention and momentum focussed, and get more people than ever talking about the issues and, more importantly, engaging with the brands they wear. There's a lot of influential people in ethical fashion rallying round the Fashion Revolution flag, and thousands of activists. We could be in for a very interesting day. Let's hope the echoes keep booming. Vote for Space For Cycling! You might have noticed that there's an election coming up in the UK. In a couple of weeks, there could be a major change in government, in the way business is conducted in this country. For once we have the people who want to be elected to office actively seeking us out to ask for our support. If you have a pet peeve or cause, now's the time to mention it. Cycling has been in the news more than ever, as more of us get on our bikes and realise that traffic infrastructure is not fit for purpose. Britain's roads, for the most part, were never intended to carry the amount of cars they see on a daily basis. As petrol supplies dwindle and we are encouraged to get out and get active, then the choice seems obvious. We need more space for cycling. Our friends at the London Cycling Campaign have been working for years to make the roads of the capital safe for cyclists. With a membership of 12,000 they're hardly a minority voice--in fact it's now estimated that more people in London cycle than drive to work. That's a group with enough collective push to persuade the powers-that-be to make the streets of the city safer and more pleasant for those of use on bikes, whether you're pedalling for pleasure or work. With local elections taking place at the same time as the General Election, this is the ideal time to buttonhole your local councillor or those running for office, and ask them what they are doing for cyclists. After all, they are the ones that could really make a difference to the local road infrastructure. The LCC has plenty of campaigning tips that don't just apply to London. However, if you are a cyclist in the capital, they are a cause that you really should be supporting. Check out their campaigning tips here, and sign their ongoing petition here. Remember, elections are the one time when we the people really get the chance to hold the politicians who claim to represent us to account. Make sure your voice is heard, and take a few minutes to get Space For Cycling onto the agenda in May. Next week sees the second Fashion Revolution Day. On the 24nd of April, the anniversary of the Rana Plaza disaster, people all over the globe will be taking time to ask the essential question--where do my clothes come from? In the run-up to Fashion Revolution Day, The View From The Pier will be looking at the whole concept of fashion in the 21st century. Can you ever be truly ethical? What needs to change to make fashion a force for good? Most importantly, as we look at the event that sparked off the whole campaign: what can be done to ensure we never see another Rana Plaza? The upcoming documentary The True Cost (which we featured on The View last week) has interviewed some big names in the ethical fashion field and asked these questions. They're featuring extended versions of these interviews on their site. Maxine Bédat, founder of ethical fashion retailer Zady, recently spoke to The True Cost. Her comments were, to say the least, eye-opening. They can also serve as a call to arms, and a way of understanding that the current model that we call fast fashion isn't just broken--it's actively harmful. "The fast fashion model that has emerged in the past two decades is based on producing the lowest cost product possible. Human labor has always been the greatest cost of production, to create these disposable prices these companies have created a race to the bottom searching the globe for ever cheaper labor. To cut corners on the production of the material, fast fashion companies are producing the material by the cheapest means possible which translates to working in countries with little environmental regulation. They are, in essence, outsourcing the true cost of the apparel to those countries desperate enough to take them. As a result of all this, the apparel sector is the second most polluting industry in the world and a major contributor to slave labor." The notion of cheap foreign goods is hardly a surprise, of course. But over the last twenty years we have seen a radical uptick in the amount of clothes we buy, even as the price we pay for them drops like a stone. It's not hard to see how this is possible, yet somehow we as consumers seem incapable of joining the dots, of understanding that materials and labour have to be at rock-bottom prices and made using sweatshop conditions to make apparal this cheaply. It's almost as if, in outsourcing the manufacturing, we've also outsourced our ability to care. "We exist in a world where 61% of clothing companies don’t even know where their garments were made. 76% don’t know where their fabric was woven, knitted or dyed, and 93% don’t know the origins of the raw fibre, so you can see that while we find it quite basic to have this type of understanding, it’s a completely different way of doing business. Knowing the source is the only way to create a product with integrity." I find it staggering that you can make and sell a product without knowing where the raw materials have come from, and yet that's exactly what's happening with fast fashion. The extended, opaque supply chain at the heart of the business means that brands can act in a kind of self-imposed bubble, only responding to calls for reform when they are actively caught in the act. Even then change is begrudging, and slow. But change is happening, and events like Fashion Revolution Day are key to that. Maxine concludes hopefully, and with a rallying cry to the people that really can make a difference... us. "As a consumer you have enormous power. When you make a purchase you are taking a stand, making a vote for what you believe in. We have the power to make fast fashion just a momentary blip in fashion history. That to me is incredibly exciting." Traditional print crafts often celebrate and depict the world from which they came. Whether that be in the colours and dyes they use, or the designs that reflect the activities of the villages in which the people that make them live and work, vibrant local fabrics often have a story to tell. All you have to do is look. The artisans of Tilonia, a village in the heart of Rajistan in India, have gone a step further. The people there have been helped by a social enterprise programme based on a partnership from the American-based Friends Of Tilonia charity, and Barefoot College, an NGO that has provided basic services and solar electricity to deprived areas of the sub-continent for quite some time. When the opportunity came to start up a business using the colourful prints of the region, the local craftspeople had a good idea. They have launched a range of bags and scarves, using designs that represent the work that Barefoot College and Friends of Tilonia have done to help the village. A warm, circular motif invokes the solar power that has been installed and maintained by women trained by Barefoot College, while a rectangular pattern represents books, an indicator of education provided to women in the region. 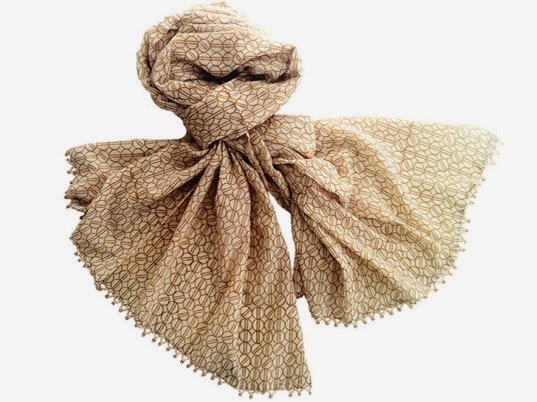 The artisans of Tilonia are skilled in embriodery, block printing and tie-dying. The new range of accessories uses those ancient skills in a clever new context, to celebrate the way modern technology has helped to transform their lives. The march towards closing the loop on fabric recycling has just taken a giant step forward, as two big names in fashion team up. H&M, the world's second largest fashion retailer, has joined forces with Kering, the French luxury brand conglomerate who has taken an increasingly ethical stance over the past few months, to announce their part in a new initiative. 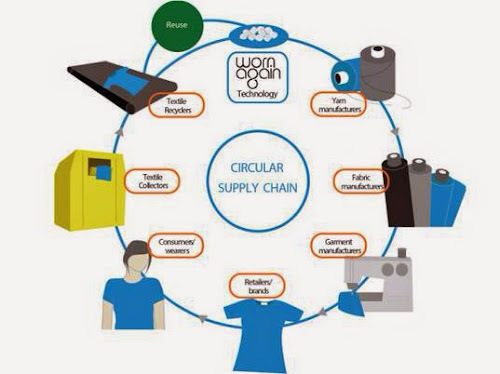 They're supporting Worn Again, a UK-based company who have found a way to seperate polyester and fabric from garments, enabling them to be fully recycled. The trouble with a lot of modern clothing is its complexity. They often contain blends of natural and artificial fabrics, like the bit of lycra in stretch jeans for example. These so-called "frankenfabrics" are almost impossible to strip apart, making a lot of the clothes we wear unsuitable for recycling in the truest sense of the word: breaking them down and making new garments from the base materials. "In the long run, this can change the way fashion is made and massively reduce the need for extracting virgin resources from our planet. Furthermore, it brings us closer to our goal of creating fashion in a circular model." Worn Again is vitally important for both H&M and Kering, providing them with a cheap and sustainable source of raw materials. This lessens the impact on virgin resources, which is nothing but a good thing. It's early days for the new initiative, but rest assured we'll all be watching the results with interest. We always check the labels on our clothes, for washing and drying instructions. But what if those labels could cary other information: like the stories of the people who made the clothes in the first place? The Canadian Fair Trade Network and Rethink Canada have teamed up to do just that, with eye-catching and thought provoking results. Their labels might be a little unwieldly, but they certainly grab your attention. And the tales they tell will make you think twice about the sacrifices that fast fashion forces on its workers. "100% cotton. Made in Sierra Leone by Tejan. The first few times he coughed up blood he hid it from his family. They couldn’t afford medical treatment and he couldn’t risk losing his long-time job at the cotton plantation. When he fell into a seizure one day it could no longer be ignored. The diagnosis was pesticide poisoning. The lack of proper protective clothing has left him with leukemia at the age of 34. He has two daughters. One of them starts work at the factory next year." Or how about this mustard-coloured jumper? A nice piece for layering on a crisp autumn day. But what does the label tell us? "100% cotton. Made in Cambodia by Behnly, nine years old. He gets up at 5:00 am every morning to make his way to the garment factory where he works. It will be dark when he arrives and dark when he leaves. He dresses lightly because the temperature in the room he works reaches 30 degrees. The dust in the room fills his nose and mouth. He will make less than a dollar, for a day spent slowly suffocating. A mask would cost the company ten cents." The notion of transparency ties into ethical fashion in so many ways, and this simple idea, of giving us as consumers more information about the workers that make our clothes, is at the heart of the struggle. The work that the Canadian Fair Trade Network are doing is advocacy, but it's based on a belief that in order to do right, we have to know what we're fighting against. Next time you check the label of your newest purchase, it might just be telling you more than what temperature to wash it at. For more information on the work the CFTN are doing, visit their website. A fascinating new documentary, coming to cinemas, digital and DVD/Blu-ray soon, hopes to make the case plain that global fashion is broken, and outlines what we can do to fix it. Director Andrew Morgan was in New York in April 2013 when he saw the headlines. A clothes factory in Dhaka, Bangladesh had collapsed, taking the lives of over a thousand workers who had been forced back to work after evacuation following the appearance of cracks in the superstructure. That building was the Rana Plaza, and the event of the following months led Morgan to vow he would do all he could to make sure nothing like that ever happened again. The result is The True Cost, a documentary that ties together the disparate threads that make up the complex web of services of fashion's global supply chain. From the slums of Bangladesh to the catwalks of Paris, the film sets out to show explicitly how our clothes are made, and why they cost so little. "For too long now, conversation around this topic has suffered from over-simplified blame games. Political and economic complexities have allowed us to miss what is unavoidably clear – that this is first and foremost a moral issue. There is consistent irresponsible care of the environment, and clear violations of the most basic human rights. But this is something we can and must change." With contributions from ethical fashion heroes like Lucy Seigel and Livia Firth (who also exec-produced the film) The True Cost promises to be a hard-hitting expose of an industry that has hidden an ugly side behind a veil of glamour. A little righteous anger could go a long way. We'll be covering the film more in the next couple of months leading up to The True Cost's release in late May. 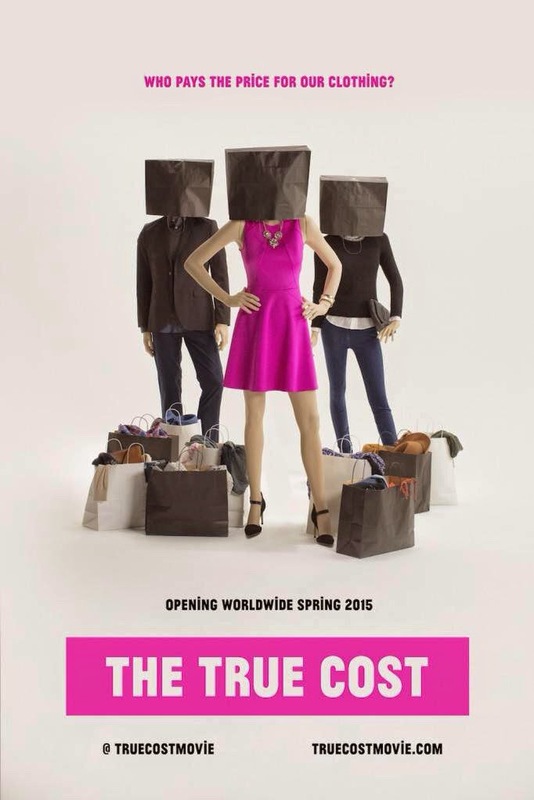 For now, check out the trailer, and hit up http://www.truecostmovie.com for more.